Age-related macular degeneration (AMD) is a frequently occurring visual impairment in the UK, leading to a gradual loss of central vision, effecting your ability to see things that are directly in front of you. The team at Parkside Hospital can provide advice and treat the progression of AMD. This page will provide you with information about intravitreal injections for macular degeneration. For further details, please speak to your consultant. 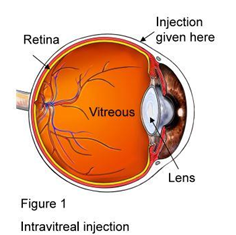 An intravitreal injection is given through the white part of your eye into the jelly that fills the inside of your eye (known as vitreous). Special drugs injected into the vitreous spread to the retina (inner layer at the back of your eye) and other structures in your eye (see figure 1). Why would I need an intravitreal injection? The most common reason is for the treatment of wet age-related macular degeneration. This is when the growth of abnormal blood vessels underneath of the macular (the part of your eye responsible for central vision) prevents your eye from functioning like it used to. This will lead to difficulty reading, colours appearing less vibrant and difficulty recognising people’s faces. Injecting an anti-vascular endothelial growth factor (anti-VEGF) into the jelly can help treat the condition by halting the growth of new blood vessels. You will usually need a course of injections over a year or longer for the treatment to be effective. Your surgeon will perform an assessment and tell you if an intravitreal injection is suitable for you. In some cases, laser treatment may be suitable, although it is less effective than an intravitreal injection. If you do not seek treatment your vision is likely to get worse. Leaving the problem for too long may cause your vision to be permanently reduced in the affected eye. The injection is usually performed under a local anaesthetic, which will be given as eye drops or a gel. The injection usually takes about 30 seconds. Your surgeon will insert a fine needle through the white part of your eye (sclera) and inject the anti-VEGF into the jelly in the centre part of your eye. It is normal for your eye to feel uncomfortable during the injection and for a number of hours afterwards. Your eye will feel uncomfortable but this usually settles within a few hours. You should be able to go home (with assistance) after about an hour. Most people will need a couple of days off work. Do not partake in activities, such as swimming, that will expose your eye to infection, and avoid heavy lifting or bending so your head is below your waist. Do not drive until you can read a number plate from 20.5 metres (67 feet). Be sure to check your insurance policy before driving. Your consultant will tell you when you can return to normal activities.